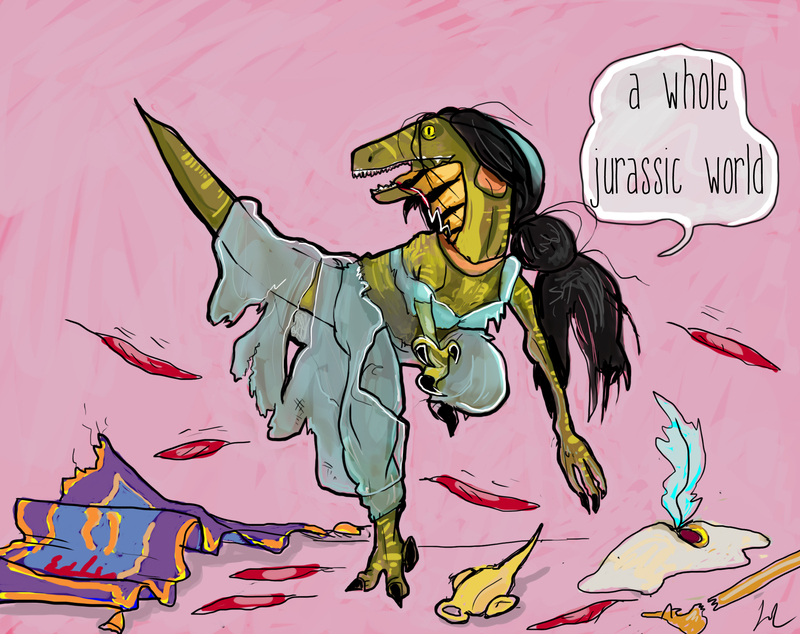 Here’s an reimaging of Jasmine as a Velociprincesses.Which is a mix between a Disney Princess and velociraptors. And if you recall that Aladdin and Jurrassic Park where both very populair in the early 90’s. Aladdin is from ’92 and Jurassic Park is from ’93. After watching Aaron Blaise’s drawing Rajah video the other day I looked around Youtube to see if there where more videos. Everyone’s favorite video site has quite a few videos of people drawing Aladdin characters. I picked the ones that resembled as close to the movie versions as possible and not the artists own interpretation of the character. And yes that contradicts with what Aaron did on his video but I personally believe these characters should look on model as much as possible. I also enjoyed watching DrawingNow doing an Al/Jas close up. DrawingTogether1’s channel has a really nice Jasmine in red drawing. Notice Jasmine has a more Disney Princess-y outfit. And finally BTSPRO does a drawing of my favorite Jasmine close-up. I could post more videos but that would make this post way to long. If you want to watch more videos on How To Draw Aladdin Characters search YouTube with these keywords for more examples. I’ve been listing to a >3 hour Disney Piano Medley on the YouTube channel of “kno Disney Piano Channel” these past days. Of course such a medley includes lovely and relaxing renditions of Aladdin’s music. In the first half an hour A Whole New World, Arabian Nights and One Jump Ahead can be heard plus Howard Ashman‘s beautiful Proud of Your Boy. The latter can be listened to in a separate video on kno’s YT channel.